The Aztecs are a MesoAmerican people of central Mexico tribe with a rich mythology and cultural heritage. In Nahuatl, the native language of the Aztecs, "Aztec" means "someone who comes from Aztlán". The Aztec also referred to themselves as the Mehika or Meshika or Mexica, the origin of the name "Mexico". The modern usage of the name Aztec was suggested by Alexander von Humboldt. 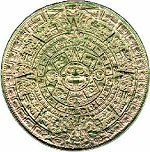 Aztecs creation myth describes four great ages preceding the present world which ended in catastrophes. Fifth age lived due to sacrifice of a hero that was transformed into the Sun. According to legend, they traveled to the Lago de Texcoco in Central Mexico from a place to the north called Aztlán. They were said to be guided by their god Huitzilopochtli. When they arrived at an island in the lake they saw an eagle eating a snake while perched on a nopal cactus, which was taken as a sign that they should found their new home on that spot. The Aztec built their city of Tenochtitlan on that site, which today is in the center of Mexico City. The legendary eagle is pictured on the Mexican flag. Initially Mexica hired themselves as mercenaries in wars between Toltecs. Eventually they gained enough to glory to receive royal marriages. Mexica rulers Acamapichtili, Huitzilíhuitl and Chimalpopoca were vassals of Tepanec lord Tezozomoc in 1372-1427. When Tezozomoc died, his son Maxtla assassinated Chimalpopoca whose uncle Itzcoatl allied with ex-ruler of Texcoco, Nezhualcouyotl and besieged Maxtla?s capital Azcapotzalco. Maxtla surrendered after 100 days and went to exile. Tenochtitlan, Texcoco and Tlapocan formed an alliance that came to dominate the Valley of Mexico, and then extend its power beyond. Tenochtitlan gradually became the dominant power in the alliance. The Aztec Empire is not completely accurate analogy to the empires of European history. It was ethnically very diverse. The most important official of Tenochtitlan government is often called The Aztec Emperor. His title huey tlatoque translates as Chief Speaker. This office gradually took on more power with the rise of Tenochtitlan, and by the time of Auitzotl "Emperor" is an appropriate analogy. Aztec military had a equivalent to military service with a core of professional warriors. Once an Aztec warrior had captured 4-5 of captives, he could attain a rank of Eagle of Jaguar warrior. Aztecs staple foods included maize, beans and squash. They also used maguey extensively. Use of cotton and jewelry was restricted to the use of the elite. Cocoa grains were used as money. Subjugated cities paid annual tribute in form of luxury goods like feathers and adorned suits. The Aztecs created artificial islands or chinampas on the Tenochtitlan lake on which they cultivated. Aztecs are notorious for their religious human sacrifice that they performed in great numbers. Aztecs waged "flower wars" to capture prisoners to sacrifices they called nextlaualli, "debt payment to the gods" so that the sun could rise every morning. Harvard professor David Carrasco has compared this practice to "bringing home the war" in modern television. Materialist anthropologist Marvin Harris has suggested that the flesh of the victims was a part of aristocratic diet as reward, since the Aztec diet was lacking in proteins. Accordin to him, the Aztec economy couldn't support feeding them as slaves, so the columns of prisoners were "marching meat". Most other historians of Mesoamerica believe that while there was ritual cannibalism related to human sacrifices, human flesh was never a significant portion of the Aztec diet. The Aztec were conquered by Spain in 1521, when after long battle Cuautemoc surrendered to Hernan Cortes. Cortes with his up to 500 men did not fight alone but with maybe up to 150.000-200.000 allies from Tlaxcala and eventually from Texcoco that resisted Aztec rule. He defeated Tenochtitlan's forces in August 13 1521. Afterwards European-brought epidemies of smallpox and typhus killed up to 75% of population. Mexico City was built on the ruins of Tenochtitlan. Information about Aztecs survives in contemporary sources like Codex Mendoza collected in 1541. Nahuatl is still spoken by Mexican Indians.